Wow! I can't believe it's May already! These past few months have flown by. Let's get back into the giveaways! Here is WHY I'm doing CAW! I have loved to draw since I was a little girl and was the one to always show up at Grandma's house with a handful of pictures. I appreciate this opportunity to create files for you to use with your little ones or your home business. Being able to stay at home with my children is a blessing and I would like to give you a little something in return! Welcome to our fourth CAW! The first week of each month will feature a new free design (coming on Thursday) and a new free (almost) verse Jesus Loves Me (Plain). Please head on over to the website to download the all of our freebies! Don't forget to like our Facebook page to stay up-to-date on all of our new releases and freebies! The reason we are taking a break from the verses stems from a recent stitchout. 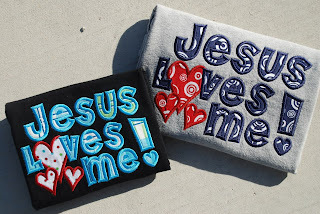 I made two "Jesus Loves Me" applique shirts for my sister-in-law who visited this last month. I LOVE that applique. However, they took a loooooooong time to trim and then stitch. 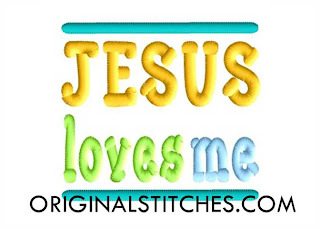 So this month, I am releasing THREE new "Jesus Loves Me" embroidery designs. This first design is available on our website as a FREE download. It's simple and could be used for either gender. The bars are the last step so you can keep them or leave them off! I think this would look great with different shades of the same color! I hope you all get a lot of use out of this one. Now, on to why you are here, THE GIVEAWAY! 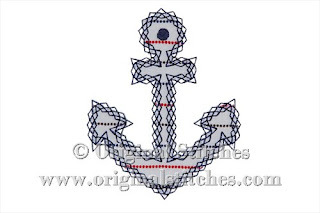 Each customer appreciation week will also feature a giveaway sponsor by yours truly, Original Stitches. 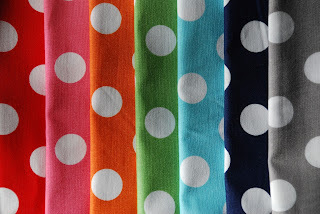 Right now, I have this lovely fabric Riley Blake Medium Dots bundle sitting here just waiting to be mailed out! I have bought a few of these fabric bundles from Hoot Couture on Etsy. I loved my experience purchasing through them. They were quick to ship and there were a few extra scrap pieces hidden in the package. 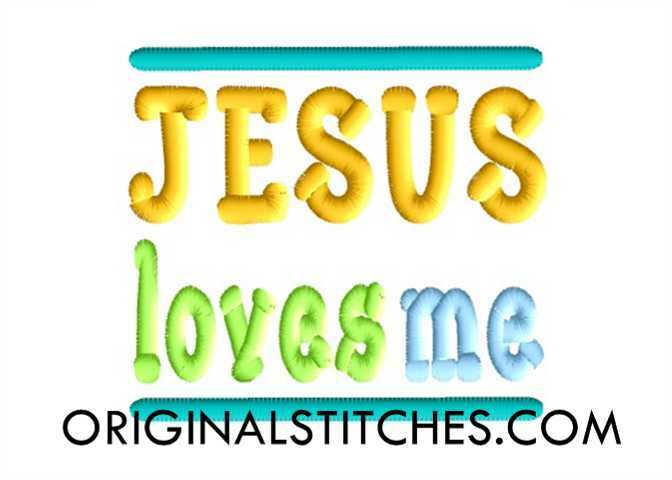 I even used one of those scraps for the mini dots on the Jesus Love Me shirt stitched in the above photos. 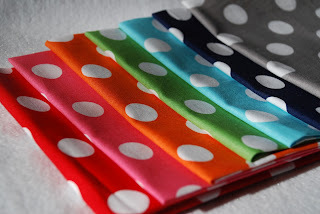 This week's guest is Elizabeth of Baby Love Customs. Please read on as Elizabeth tells us a little bit about herself, her business, and her inspiration. I am currently a work at home mom to 3 boys, Judge-3, Zavier-18 months, and Sidney-4 months. My grandmother first taught me to sew when I was 8 years old. I have been sewing off and on ever since then (16 years! ), but never really tried to teach myself anything new. One of my New Year Resolutions this year is to learn more advanced sewing skills. I hope to eventually start making clothes for myself and to sell in my boutique. I first became interested in embroidery when a close friend of mine offered to make a few personalized items while I was pregnant with my middle son in the summer of 2011. Her mom had a machine at the time, little did we know, we would spend countless hours at her mom’s house in front of the machine. It quickly became an obsession, haha! About 2 months later, I finally convinced my husband to let me buy my first embroidery machine. Right now, my favorite items to embroider are shirts and baby gifts, especially for little girls! Since I have a house full of boys, I really love being able to make cute, girly items. I’ve always told my husband that we would be in trouble if we ever had a girl, lol. In October of 2011, Baby Love Customs was born. I started selling on Etsy (www.babylovecustoms.etsy.com) then expanded to Facebook early in 2012 (www.facebook.com/babylovecustoms). 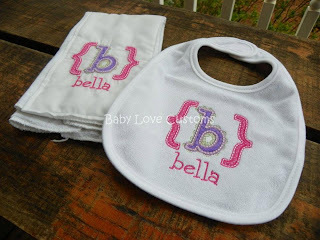 As of March 2013, I have launched my first website (www.babylovecustoms.com). I love seeing new, adorable designs from all the awesome digitizers out there, and not too long ago wanted to try my hand at it as well. I love having the ability to now create my own unique designs. I offer custom shirts and onesies for every occasion, baby gift sets and diaper bags/tote bags of all kind. Holiday shirts are always big sellers. The best pieces of advice I can give anyone about applique and embroidery is to never be afraid to try something new, and ask questions! I am part of several online groups for applique (my favorite being Applique This & That Too on Facebook), they are large groups of people always willing and able to answer questions and give inspiration and encouragement. I would like to offer readers a coupon good for 10% off any order placed through www.babylovecustoms.com using code OS10, valid through April 30, 2013. Thank you so much for allowing me to be a part of this!